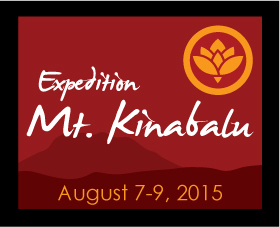 The months of planning and preparing for Expedition Mt Kinabalu 2012 have come to an end. The climb was a success and now everyone has left, mostly by plane, back to their countries, their homes and their families. I decided on my last day in Kota Kinabalu, to take a boat trip out to one of the nearby islands, to take advantage of the fact that I was free for the day. As the speedboat left the dock I looked back at a cloudy sky, and noticed every now and again, Mt Kinabalu emerging in and out from behind the clouds, childlike, as if playing a game. It made me smile. I reflected upon our recent climb as I kept looking back at the mountain dancing with the clouds. Although we had a few parents who were climbing for their sons, most of our 64 climbers who participated this year had never heard of Duchenne muscular dystrophy. Over the months before the climb they had contacted me, wanting to be part of our quest to raise global awareness for Duchenne and to help make a difference. The two-day climb was challenging. The first day was a long hike up to 11,000 feet where we spent the night at our lodging Laban Rata. Much of the group arrived in the pouring rain and by mid afternoon a heavy mist had swept in, dampening any hope of seeing the mountain peaks above. The tiredness of the day kicked in and the altitude didn’t help, but we were all upbeat and happy to have the day’s climb behind us. The weather on Mt Kinabalu is unpredictable, and sometimes the summit trail is closed if conditions get too dangerous. With the rain beating down outside, we listened to this briefing while we ate dinner. The next day came around quickly, and not many of us slept much. In the early hours at around 2 am, we began to get ready for the last 2,000 feet to the summit. As we busied ourselves getting equipped with jackets, headlamps and gloves, I suddenly realized that not only had the rain stopped, but above, the stars were all around us. This meant that we would have a most amazing view from the top, and most exciting for me, we would be there to greet the sunrise. As the dawn approached we saw the shadows of the peaks on either side of us, and in the distance, a trail of shimmering lights from everyone’s headlamps leading us to the top. The last hour was a test of physical endurance and mental resolve. The rock face was slippery and relentless. Out of the darkness we clambered over the last of the granite boulders as the sky transformed into a kaleidoscope of colors. We reached the summit in time for the sunrise. After the long climb the victory was sweet. Being surrounded by the sky’s comforting colors felt tranquil and peaceful. The climb down had its challenges, with some slips and falls here and there, but nothing serious. By the time we arrived at the bottom, Mt Kinabalu was completely shrouded in its cloak of mist. Back on my island trip, from the boat, I once again glanced back at Mt Kinabalu. I could make out the faint outline of its peaks through the distant clouds. I smiled again to myself and then smiled at the mountain. I was reminded of our oneness and how we all came together for something good. 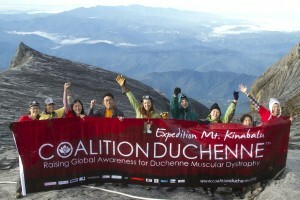 Everyone travelled to Sabah, leaving behind their busy lives, to climb for all the boys and young men with Duchenne. Our complaints of exhaustion, of our tired and aching muscles faded to thoughts of the boys and young men who we climbed for. It was in the quiet moments that we understood why we were here. It is the smiles I will remember; smiles when we reached the summit, and when we got back down the mountain. But it is the smiles of the boys and young men with Duchenne that I will remember most. The smiles of Albert, Azmi, Edmund, and my son Dusty, innocent, pure and playful, that are etched into my mind. Again, like I always do, I blinked Mt Kinabalu into my memory. Great Article as usual Cath – congratulations. Exciting read. There is currently quite a lot of delitas all-around this subject all over and about about the net and some are most defintely far better than others. You might have caught the detail here just correct which makes for a refreshing change thanks.